MANA POOLS - Management Plan - Graphic. Rules and Regulations for visitors to Mana Pools National Park designed to ensure safety, enhance and maximise every visitor’s experience as well as protect and preserve the pristine wilderness of this World Heritage Site. Rules and Regulations for visitors to Chitake Springs National Park designed to ensure safety, enhance and maximise every visitor’s experience as well as protect and preserve this wild and fragile part of Mana Pools. 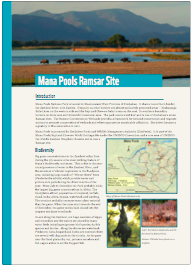 Mana Pools park history, geology, fauna, flora and other useful information for visitors. MANA POOLS - checklist of birds NEW UPDATED EDITION!